The University of Otago 2018 Arts Fellows. 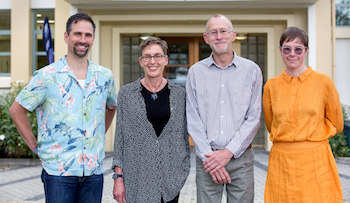 From left to right: Matthew Smith - Caroline Plummer Fellow in Community Dance, Rhian Gallagher - Robert Burns Fellow, Raymond Huber - University of Otago College of Education/Creative New Zealand Children's Writer in Residence, Louise Menzies - Frances Hodgkins Fellow. Dylan Lardelli- Mozart Fellow had not yet arrived. Photo courtesy of Sharron Bennett. At the University of Otago we believe that our writers, artists, composers, musicians and dancers have a vital role to play in the health and well-being of our community - not just the University community or the Dunedin community, but the wider community of New Zealand.We look to them to offer us visions we cannot make ourselves; we rely on their craft to generate the experiences which will challenge us, entertain us, provoke and reassure us, and tell us who we are. Application Forms for the new round of Fellowships will be available in March each year.